Three levels of on-line advertising with 585wedding.com! Choose the level that works best for you. Our top level vendor account, Showcase Vendors can virtually create their own website within a website! Your account can be listed in up to five categories, including your own photo gallery, video gallery, and map to your location. You also have the option of adding your brochure or menu to a fully interactive flipping book presentation, as well as your very own virtual tour that you can link to or embed directly into your own website and/or facebook page! As a Showcase Vendor you will receive automatic bridal lead notifications as future brides register and request additional information in the category or categories you are listed under as well as receive discounted participation in bridal shows and bridal bag events throughout the year. For a comparison of the vendor account levels, pricing and benefits click here. Premium Vendors’ company name, phone number, mailing address, website link, facebook page link, and brief description of services is listed on up to five category pages. Receive emails from interested parties through 585wedding.com’s online email program and enjoy discounted participation in bridal shows and bridal bag events throughout the year. Company name, phone number, and mailing address listed on up to five category pages. Receive emails from interested parties through 585wedding.com’s online email program. 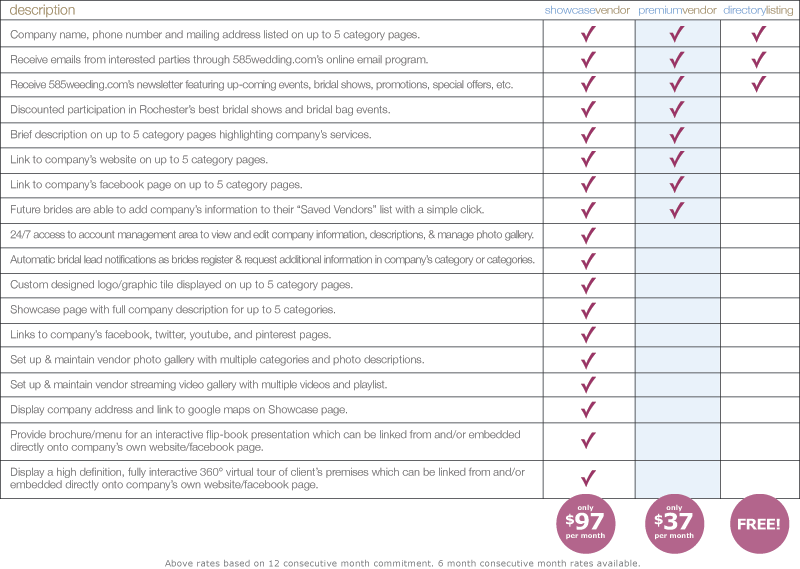 Compare the three levels of on-line advertising with 585wedding.com! Which option is best suited to your particular requirements? Use the comparison chart below as a quick reference to the various features & benefits included with each option. Include your adverisement in the 585wedding.com magazine, printed and distributed six times per year to numerous locations throughout Monroe, Ontario, Wayne, and Yates Counties. In addition, each issue is direct mailed free to our huge list of between 4,200 & 6,500 future brides! 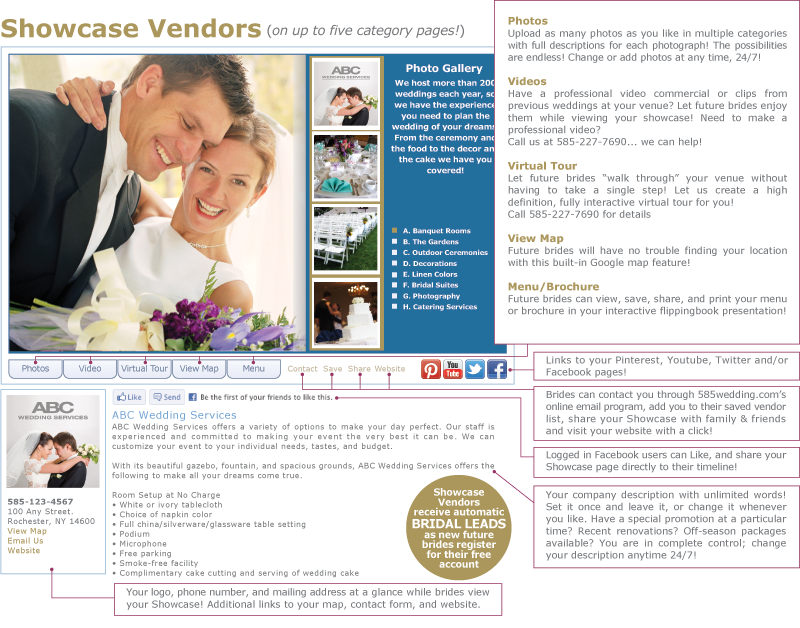 With each issue your advertisement is included, you can enjoy all of the benefits of your Showcase Vendor account in up to five categories with 585wedding.com at no additional cost! Each issue of the 585wedding.com magazine is equal to two months of advertising both in print and on the web! For the issue advertising dealine click here. For ad sizes and pricing options click here.